Lately I’ve been obsessed with using corn flakes to “faux-fry” everything. 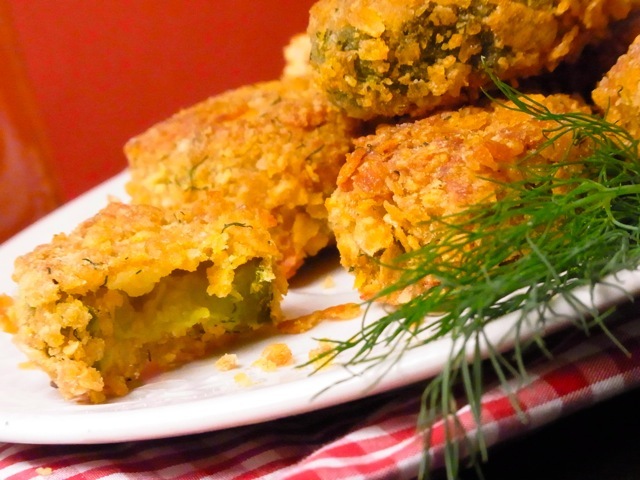 I wrote a post recently where I made Faux-Fried Zucchini. Corn flakes, when used as a breading and baked, do a fantastic job of mimicking fried batter. A few days ago Ned requested that I make a few of these Faux Fried Pickles. This recipe was inspired by the deep-fried pickles served at The Hamilton Tavern, a restaurant in our old home town in Baltimore. When purchasing pickles for this recipe try to buy thicker cut slices, about 1/2″ in thickness. They will hold-up better when baked. Drain the pickle slices and pat them dry using paper towels or a clean kitchen towel. Set slices on a plate lined with paper towels to allow them to continue drying while you prepare the rest of the ingredients. You will now have three bowls for breading your pickles. Arrange them assembly line style, with the cornmeal bowl first, then the egg mixture, and lastly, the corn flake mixture. Brush a sheet pan with olive oil. 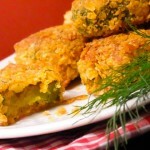 Next, take a pickle slice and cover in with cornmeal. Dip the slice into the egg mixture; then, into the corn flake mixture. Double dredge the pickle slice by returning it to the egg mixture then back into the corn flake mixture. Place the coated pickles on the greased sheet pan, about 1″ apart . Repeat the process until all pickle slices are coated. Bake in the center rack of the oven for 10 minutes. Then, flip the slices over and bake for an another 5 minutes. Remove from oven and sprinkle with extra sea salt if necessary. Serve hot along side chipotle sauce. Whisk together. Serve immediately or refrigerate for 1 hours to allow flavors to marry. Now you are taking my language!